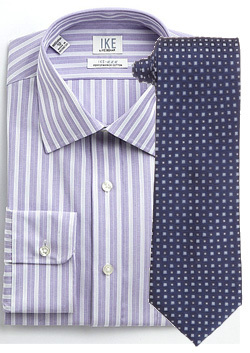 A plain shirt with a striped tie not only gets boring, it's entry-level. Learn to pair patterns and stripes with these 8 examples. Some things mix well together. Peanut butter and jelly. Ham and cheese. Navy and gray. Other things don’t mix so well. Oil and water. UNC and Duke. Black and brown. 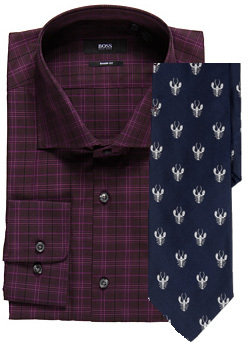 Many men have trouble matching fabrics, colors and even more so, patterns. Stripes with stripes? Checks with checks? Yes, it’s possible and in certain circumstances we even recommend it. 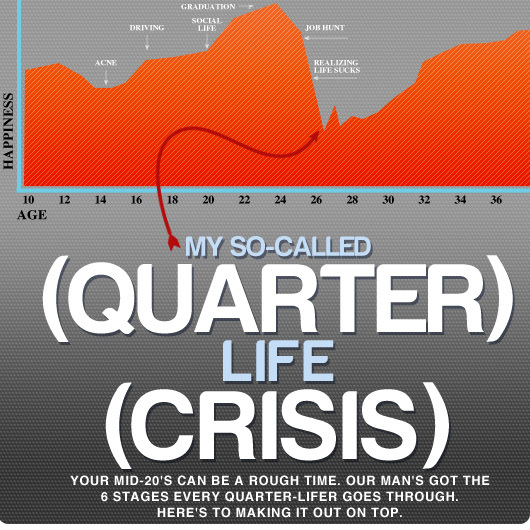 As with most things in life moderation is key. The most well-dressed men understand that wearing two or more patterns adds visual texture and lets viewers know that he isn’t afraid to mix and match. However, there is an art to the game. The human eye can only handle so many patterns. In fact it can only handle four at time. Only the most skilled and advanced dressers can pull off four patterns at a time without looking like a kaleidoscope, so we recommend no more than two for the regular guy just starting out. the wearer for that matter. The most important thing to remember is that it takes practice. No one gets it right the first time and over time each man will gravitate toward the patterns he likes and what suits his personality. Once you find the right combo, the rest is gravy. To me it all looks really tacky… unless they’re both stripes, more than one pattern just crosses the line into garishness. I like the first and third selections, they’re really nice. The fifth and eighth ones look incredibly busy though! @A.Stev It’s unfortunate that you believe the only two patterns that mix happened to be the same patterns. While two stripes together is “wrong”, it can become stale and boring and let’s others know that you have a limited range. If however, this is your personal preference, by all means only wear stripes. The examples given are just that–examples. If you’re not fond of that particular check or stripe, or dot, then find another. The idea is that other patterns and you shouldn’t be afraid to experiment with them. @Rob – Thanks for your comment. The 5th combo is a bit out there. It’s supposed to be. 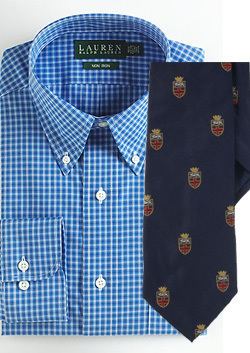 However, it works because the tie is the dominant focal point since the graphic is larger then than the print in the shirt. Again, its an example of which to follow. 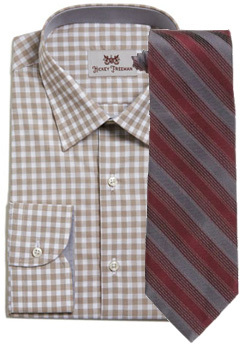 Large patterned tie, small pattern shirt. 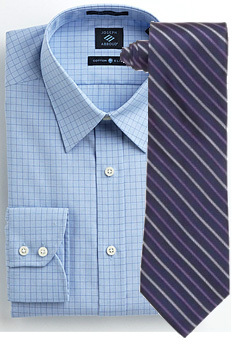 Also, since the tie is navy it marries well with the deep purple background but also jumps off the shirt as the focal point. The 8th combo utilizes stripes and dots and/or paisley. 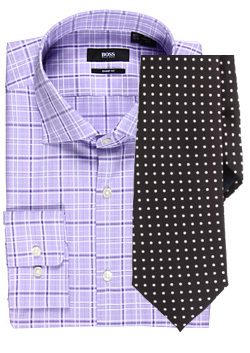 Stripes marry the best with dots and paisley. 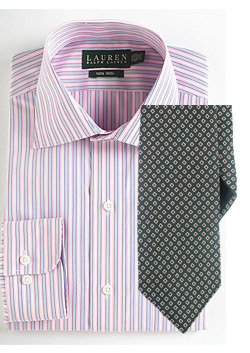 The green background of the tie picks up the hints of green in the stripes of the shirt. If you’re not accustomed to wearing patterns –like most men aren’t, this will take some time to get used to. However, it’s a skill all serious dressers acquire. I can’t count the number of people I see every day that run around dressing like they spent the morning dressing next to an exploding clothes donations bin. Please, please don’t try to impress the world with your avant-garde tie pairings and quirky socks. I get that the theme of this post is to encourage mixing of patterns, but every single example here is incredibly gaudy. If you want to mix patterns successfully, be subtle. 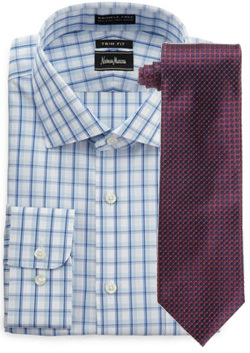 There is nothing — absolutely NOTHING — worse than a guy that thinks he’s Sartorialist material just because he dared to pair a tacky polka dot tie with an even tackier check shirt. Seriously, it doesn’t take a genius or great courage to do that — the reason it seems so “uncommon” is because most people have the good sense (and taste) not to. Call me conservative, but I believe great fashion choices are like great typography choices — they should be invisible. If people are noticing your choices, you’ve already done something terribly wrong. Great fashion is as much about saying no to the plethora of bad choices (like this article) as it is about making good ones. Sorry to judge you so hard. I liked where you were going with this, but not the result. In the words of reason; if you do not care for the way someone looks, look away. Great pairings, things I would never think of. Like every suggestion, time to branch out. I think the gauge of the patterns is too close on #8, but otherwise these look great! I think even the most conservative guys out there could pull of #4 and #7. These are quite bad pairings. You can match two patterns in a much subtler way. These are all terrible matches. First poster is right. I love all the combos..